Black Rock City (BRC) , the world's foremost spontaneous city. Put together in the spirit of jazz improvization but bumpin' 24/7 to the rhythm of rave. 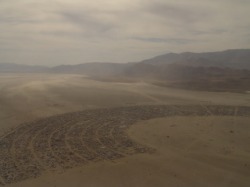 This nomadic encampment is inhabited by artists, free spirits, malcontents, intellectuals, philosophers, partiers, spiritual seekers, anarchists, eccentrics, adventurers, poets and not to be forgotten by the undisputed superstar of the city Burning Man himself. The tribal/primitive yet futuristic atmosphere that all these participants lace the city with is nothing less than one of the greatest festivals on earth. There are no spectators here. Everyone is a bona fide artist in their own right. Contributing their skills, labor, creativity, enthusiasm or just their pure and wild spirit appreciating the existence of this happening in their own way. If there ever was an archetypal city known for its tolerance, Black Rock City is it. Celebration of the artistic soul. Celebration of creativity. Celebration of freedom. Celebration of ideas, of art, of one another, of existence itself, of the amazing beauty of the nothingness of the Black Rock desert and the amazing beauty of what humans can do when they cooperate in a "harsh" environment for the benefit of one another. Celebration of the human spirit pure and simple. Most of us visiting Burning Man from other planets have been coming to Burning Man for years. Each year we leave refreshed and inspired with the knowledge that humanity can prosper, and appreciate one another be that the individual, culture, religion, or what not. This is what Burning Man reminds one of year after year. Some find spiritual meaning in the burnig of the man. Others, and excuse to party. Some an excuse to create in a supportive community of individuals that appreciate their work. We say to each their own. Burning Man has no preachers. No labels. No labels. With labels their are limits and the true spirit of creativity is then stifled: dead. Black Rock City is about life, the celebration of creativity, the wilderness and the human spirit. The wilderness environment--the Black Rock Desert--where Black Rock City is born and Burning Man takes place can be likened to the 17th Century philosopher John Locke's idea of the Tabula Rasa or clean slate in which nothing exists and all is possible. In a more contemporary sense it can be described as the physical manifestation of the internet in which one can create anything they dream up, add or delete whatever meaning they desire. On the playa no meaning is preached. Any meaning one arrives at (on the playa) is in the mind of the beholder. In Black Rock City you have freedom in a tolerant community. Create your own meaning. Create yourself or change your identity. Black Rock City and its community provides only a context for your mind to choose whatever meaning it desires. Burning Man is a true American event, where diversity is respected and moreover praised. Tolerance is the way and freedom is the rule. Creativity is out of control. Inspiration flows and the philosophical mind is ignited. There are no idols or superstars here. We are all self sufficient worthy individuals. Only in America. American values in bloom. All equal, all empowered. It is not Utopia and doesn't try to be. But you can't fool the many who make a pilgrimage here, from every corner of the globe, year-after-year.